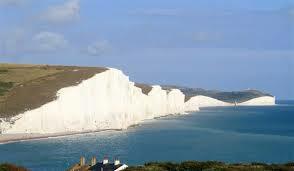 It’s a tiny bay situated on the Southcoast betwixt Crowlink and Beachy Head. Nestled between the third and fourth of the Seven Sisters, Birling Gap was once a smugglers cove, and an outlet for ill gotten swag. How the plunderers scaled the chalk cliffs and traversed the rugged heath to East Dean … escapes me. I’m heading that way now and will look out for it on wednesday when I’ll be walking all Seven of the sisters.